This is a free sample activity from PronPack. You can watch a video with Mark Hancock using this activity in class here and read some thoughts on teaching sound and spelling patterns more generally here. 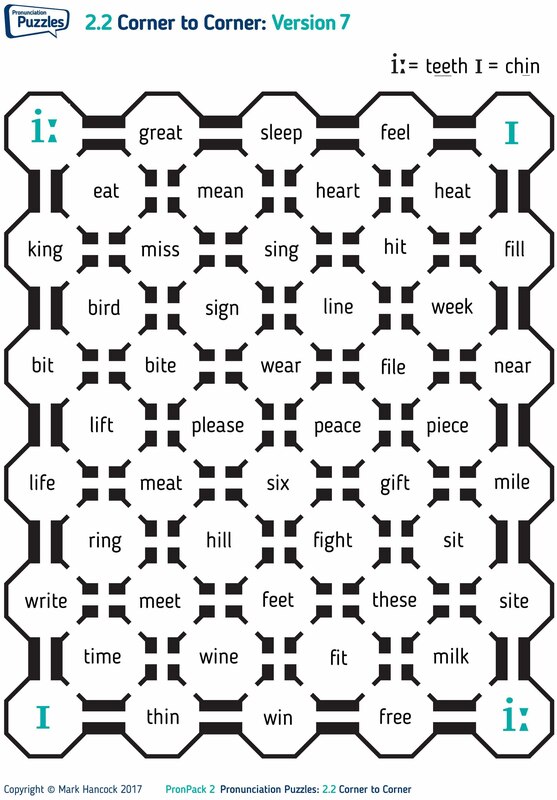 Ask students to find a route from the top left corner to the bottom right, going through a room only if the word in it has the same vowel sound as TEETH. Go through the first few rooms together as a class to get them started. Now ask students to find a route from top right to bottom left only if the word has the same vowel sound as CHIN. Check answers together as a class. Elicit what are the most common spellings of the two vowel sounds, and ask them to find some exceptions. You may highlight some of the points of interest below. - The ‘ea’ spelling is usually pronounced as the TEETH vowel. Words like ‘great’ are exceptional. - Where ‘ea’ or ‘ee’ are followed by an ‘r’ as in ‘near’, the vowel becomes a diphthong, so that it is no longer the ‘TEETH’ phoneme. This may also happen slightly if there is an ‘l’ after the vowel as in ‘feel’, but not enough to make it a completely new phoneme. - Notice the homophones piece / peace and meat / meet. - The ‘i’ spelling is often pronounced as the CHIN vowel, but there are plenty of exceptions. The most notable is when there is a silent final ‘e’ – compare ‘win’ and ‘wine’ for example. - When ‘i’ is followed by an ‘r’, the vowel changes so that it is no longer the CHIN phoneme – look at ‘bird’ for example. - Vowels are slightly shorter when followed by an unvoiced consonant. For example, the vowel in ‘hit’ is slightly shorter than the vowel in ‘milk’. They are still the same phoneme, however.